I’ve been adding to this post for a long time, as I think it’s a super important aspect to any business and I didn’t want to miss a single thing! My aim here is to help shed a little light on how to identify your IDEAL target audience (note that word!) and also provide a mini worksheet to help you on your way to really nailing who you want to target. Having a clear idea of your audience saves you a whole lot of time, money and energy in the long run as you will be able to start on the right foot and target those people rather than just throwing the net out and getting anyone - and more than likely a lot of people that you actually don’t want to work with/can’t provide services for. What do you mean by ‘ideal’ target audience? I am a firm believer in intentionally deciding on who you want to work with, so being thoughtful about choosing your ‘ideal target audience’ or ‘dream client’ will make a world of difference to your day to day life as a business owner. With the proliferation of freelance designers popping up everywhere, the Internet and social media bursting at the seams with eager consumers and everyone suddenly being able to connect, this opens up millions more people to work with (or not work with) and working this out will increase your career satisfaction, mental wellbeing, income and professional output. There is no rule out there that says you have to have a certain service/product and these are the people you need to appeal to (no way!). You can CHOOSE the audience you would most love to work with, use that insight to target them, and believe me they will come! So, what happens when you don’t know your target audience? If you try to create a brand before you identify your target audience, it will likely end up as uninspired or less appealing to your ideal customers. If you don’t know who that target audience is, you can’t use intentional language/address the pain points that mean the most to them. People usually don’t have a strong love for generic brands with no personality. Your ideal audience will always prefer a brand they can identify and connected to. Clients who aren’t a fit can become a drain on your time and energy (especially if you are a solopreneur!). They may be unable to fully benefit from your services and require extra time and attention — and still be unsatisfied. When a brand looks and sounds generic/like every other business in its industry niche, it loses the ability to stand out from competitors and differentiate itself or show audiences why it is better than another brand. When you don’t know your target audience, you can’t comprehend or visualise their needs. It’s almost impossible to anticipate how your clients will feel about your services — much less improve your products and offerings based on audience perspectives. So, now you know it’s super important to identify and intimately know your target audience, right? Let’s get started! What do they believe strongly in? What are characteristics of their personality? What are their pain points/frustrations? Set up in-person interviews - Have your sights on someone/the people you think you want to target? Seek them out and see if they will have a sit down with you so you can pick their brains and get real in-person answers. Survey and poll - Can’t get in the same room as the clients you want to target? Reach out in forums/Facebook groups and set up a poll or survey they can fill out. Research your Analytics - Chances are you may have already set up a website and/or social media account for your business, so this can be a great place to start just to check out what your audience is up to/who they are/if they are who you want to be targeting/ where they are from etc. Research your Competitors - Know of another business in the same niche as you or who you think looks like they are working with the clients you want to work with? Analyse the people interacting with their brand through their social channels or via their website. Assumptions and wishlists are absolutely fine to start out with especially since you are choosing your ideal audience, but fact-checking some of the information you have written down just ensures your dream clients do in fact exist and would find your product/service appealing. Once you’ve gotten the above info, turn the information into a story - aim for 3-5 personas that cover who the person is, what they need and the problems they face. Targeting a group (or B2b)? That’s fine too! You can break a number of personas into groups and identify their needs and problems. Give them a name (think outside the box, you can just have ‘Melanie’ or you could have ‘Flourishing Families’ as a category instead to name them) and add photo to the story to help your ideal audience to life. 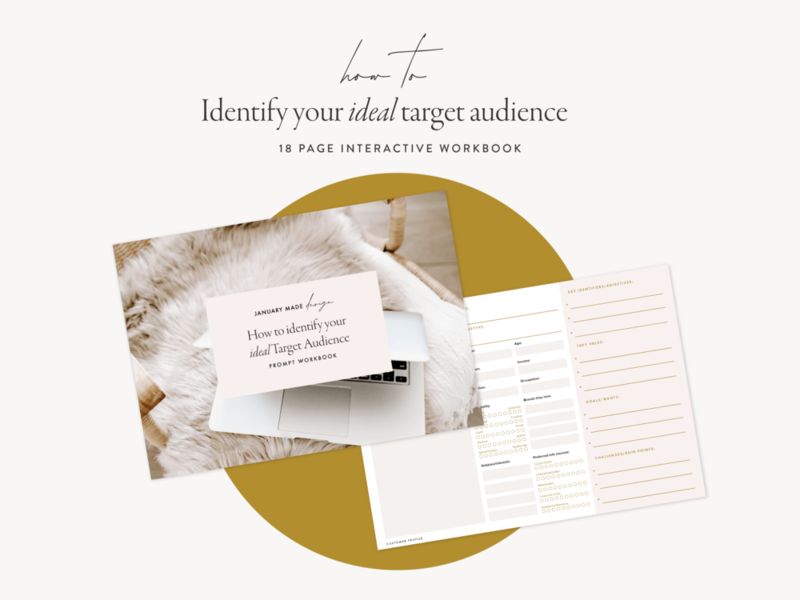 To help identify your target audience, I’ve added some worksheets from the ‘How to Identify your Ideal Target Audience’ Prompt Workbook to provide prompts on visualising your customers. 18 pages of audience prompts in an interactive or printable PDF workbook to help you define your target audience, checklists for research and so much more!